When purchasing the prime piece of equipment for your business, you want to make sure you get it right. 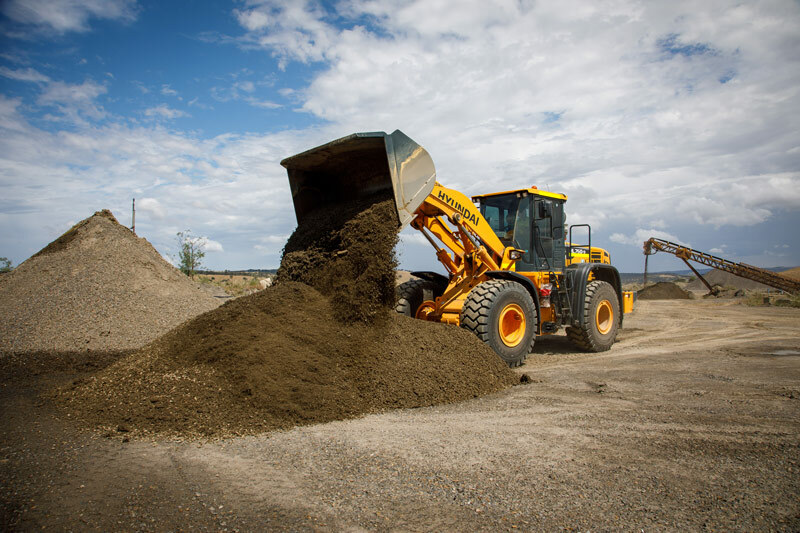 This is why Jarred Thorpe, the manager of Victor Harbor Quarries in South Australia, was so impressed with the service provided by Porter Group when updating the company’s wheel loader. "We were leaning towards buying another brand, which we’d had before," Jarred explains, "until Tim [Sharrad, territory manager at Porter Group in SA] came down and ran us through the Hyundai HL760-9 and was willing to let us trial a used one for two weeks to see what it was like." This shows the lengths that the New Zealand-founded Porter Group is willing to go to accommodate each client’s diverse needs. Porter is a supplier of world-leading brands, like Hyundai and Furukawa, through sales and rentals, as well as offering servicing, parts and machine financing. Established in 1945, the company now owns 50 retail locations across Oz, New Zealand and the US. In the end, Jarred was so happy with the loader that the business crunched the numbers and ended up purchasing a new one. "After that, Porter left the used loader here for us to use until the new one was ready," he says. "So we had that for eight-and-a-half weeks while they built the new one and put it together." Other factors also came into play when the quarry was tossing up between the Hyundai and a competitor’s brand. "In the end," Jarred says, "the price difference between the two machines was about $100,000. "Also, the other operators and I found that loader was quite comfortable to sit in. Because you’re in it for eight-and-a-half hours a day comfort is key," he says, adding: "The inside is very modern and very ergonomic." 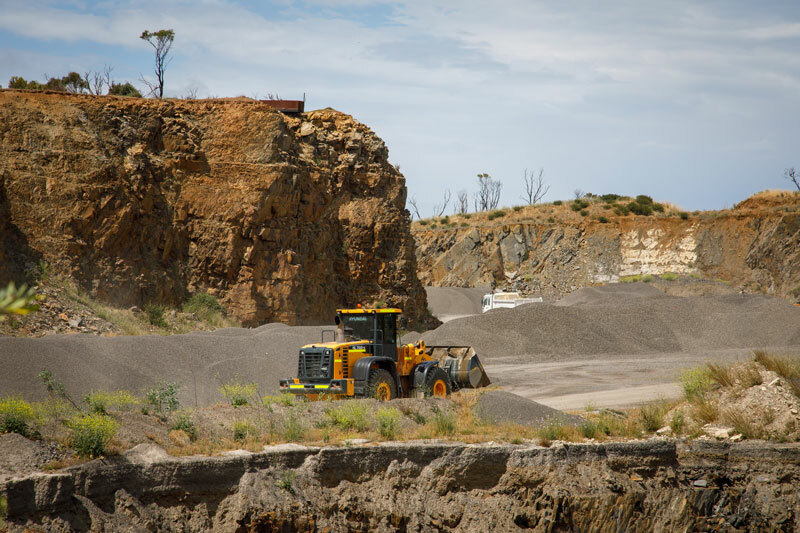 The loader’s other cushy features – including an advanced colour LCD-display and audio system, full automatic temperature control and a spacious cabin with increased visibility – make for a good day at ‘the office’, also taking into account the quarry’s picturesque setting. Earthmovers & Excavators’ one-hour drive up from Adelaide to the coastal locale – coincidentally set on Porters Hill – meant passing rolling hills and cattle-dotted farmland. From the quarry itself you can see a glimpse of azure sea, the popular Granite Island (known for its fairy penguins) and the lush Inman Valley. The site covers about 40ha, of which about 10ha is devoted to extraction. The quarry’s been in operation since the early 1900s – first worked by the local council before other corporate companies leased the site, with the Thorpe family purchasing its rights in December 2015. 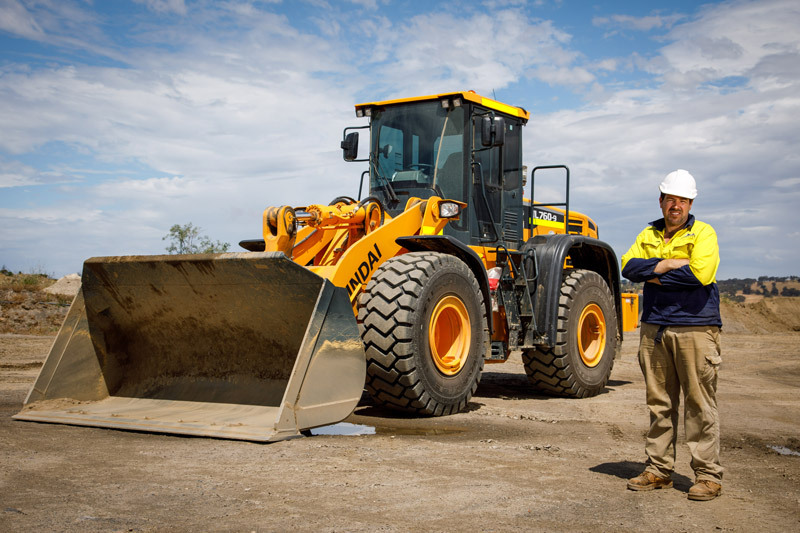 Jarred’s father, Jeff, is the quarry’s director, as well as being at the helm of another family business, Kangarilla Earthmovers, operated with his other son, Marcus. 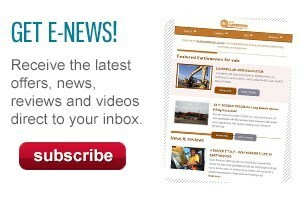 As often tends to happens with family businesses, the two companies "leak into each other", with the earthmoving business regularly contracted by the quarry. The quarry itself has a staff of seven, a fleet of five mobile plant machines, and operates from 7am to 4pm weekdays. 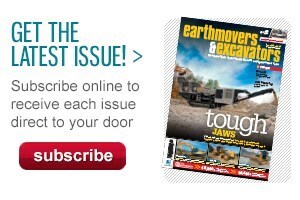 When Earthmovers & Excavators magazine visits, the wheel loader is being used to help in the job of mixing rubble and wetting the product so it holds together – a client request. "The loader’s main job is to move stuff around and load out trucks," Jarred explains. This includes being driven down into the deep pit, where some of the rock is stored when they’ve run out of room up top. Of the post-extraction process, Jarred says: "The rock goes through the [1970s-built] crushing plant, which breaks it down into sizes, then it gets stockpiled into categories – for road bases and screenings, in different sizes – then it’s loaded onto the truck to go off site." 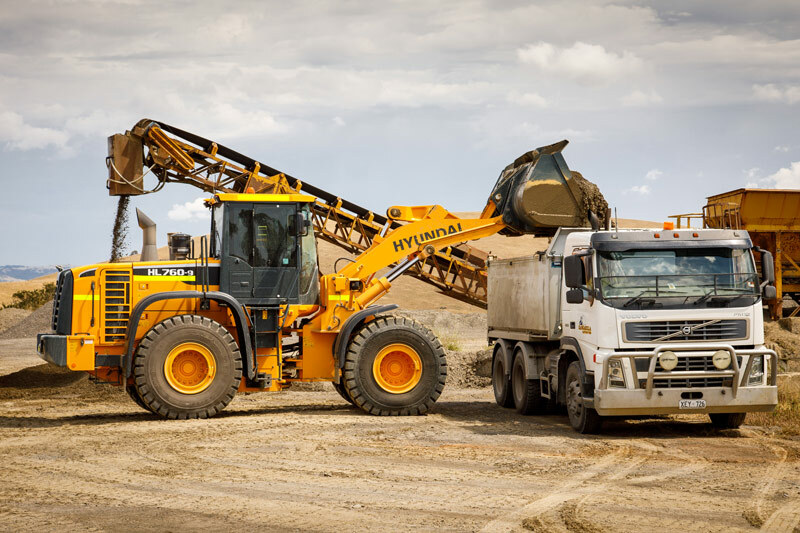 Along with the Hyundai HL760-9 wheel loader’s other cost-saving features, such as a hydraulic-driven cooling fan to reduce fuel consumption and a remote management system to track machine performance, there’s one that got it over the line, according to Jarred. "One of the big features with it is it’s got an integrated scale system to weigh your loads, whereas a lot of other machines have an after-market product which they’ve got to put on afterwards," he says. "So this also saves you about $10,000." The rock at Victor Harbor Quarries is generally comprised of dark grey, fine- to medium-grained schists to greywackes with quartz veining quite common throughout. This variety of product led to the business also seeking an add-on for the loader. The loader’s main job is to "move stuff around and load out trucks"
"We got a larger counterweight than the standard one – about two tonnes – on the back," Jarred says. "There’s different rock in different places. We have a large density rock, and the denser the rock is, the more it weighs per bucket, so the extra counterweight adds stability to the machine." Much of the quarry’s product is used locally, with recent clients including the new Aldi supermarket at Victor Harbor, and the Alexandrina Council for erosion control at the popular tourist destination of Hindmarsh Island — helping to "retain all the sand behind the rock" which seawater would ordinarily wash away. No doubt the quarry’s new Hyundai HL760-9 will keep up its near-nonstop activity, aiding more projects in pretty settings, well into the future. And Victor Harbor Quarries’ budding relationship with Porter Group will only continue to flourish.